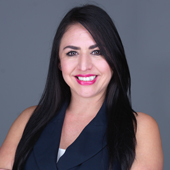 Veronica Salazar,was born in Corpus Christi, Texas and has spent the majority of her life in the Houston and surrounding areas, from Sugar Land all the way to Galveston.Veronica has been in the hospitality and restaurant industry since the age of 14. She catered to Midtown, Uptown, and Downtown Houston’s, Restaurants, Lounges, Pubs and Clubs. She loves engaging with her clients in efforts to provide them with excellent and friendly service with a smile. She attended Houston Community College where she received her Associates in Arts. Veronica also has passion for aesthetics. She attended the Texas Laser Institute where she became a Professional Laser Hair Removal Specialist, and certified in IPL Photofacials, Tattoo Removal, even vein treatment and so much more. Her experience has given her an impeccable sense of urgency, diligence, professionalism and empathy. Her clients are treated with respect, confidentiality, compassion, and dignity. She has the same rapport with her clients in real estate. Her numerous years in working for the public has shaped her ability to be an efficient and effective communicator whom is able to listen, understand, and connect with her clients in order to provide exceptional service. If you are in the market to buy a home, she will furnish all the necessary tools for you to locate your dream home and make an educated purchase. She will aid in all aspects of buying a home in a new or unfamiliar area, making the transition to a new community easier than ever. If you are interested in selling your home, Veronica will partner with you to prepare the home to ensure top market value. She will make sure your property reaches every qualified buyer by using a customized marketing plan designed around your homes unique selling proposition. Veronica’s superior work ethic coupled with her negotiating skills will ensure you receive the best value for your money. She will answer any questions you may have throughout the process to ensure a smooth and rewarding transaction. Overall, her knowledge in the local area market will make your buying or selling experience exciting and fun! When Veronica is not working with buyers and sellers to find their next dream home you can find her with friends and family enjoying an Astros, Rockets and Texans game, playing a 18 Hole game of golf, spending time in the sun, or watching a new movie at her favorite spot Star Cinema.